I was surprised by the sloppy technical aspects. Sound issues and continuity, which I normally don’t notice or at least forgive, was more than distracting though out the film. It felt like it was a bit of a rush job which makes no sense. But back to the good. 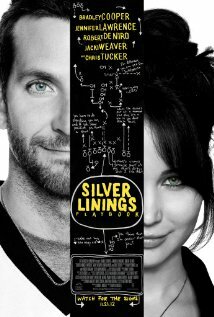 As stated at the top, Bradley Cooper and Jennifer Lawrence were excellent. Especcialy Lawrence. I have never seen this side of her and am happy to report that she pulled it off. The supporting cast was great as well with the return of Chris Tucker and Robert DeNiro is in top form as the football loving Dad with OCD. A bit of guilt beguiles me as I type this and maybe I am guilty of nitpicking here. I love a good dark comedy and this is both dark and was at least shooting for comedy. There are some laughs, but more clumsy attempts at predictable touching moments which were effective nonetheless. I fought them off, but tears won the battle and were set free down my cheek by the end. When held up against his other movies, this one lands in the middle which makes it a far better movie than most everything else out there. Posted on Friday, November 30th, 2012 at 1:39 am and is filed under Reviews.